Astana, Kazakhstan – Paulo Miyao was ejected today from the 2018 UWW World Grappling Championship due to a breach of his USADA doping suspension. The Brazilian 66kg grappler was disqualified after winning his first match by submission against Amon Yunusov of Uzbekistan. Miyao was issued a doping suspension by USADA following a positive test relating to the 2016 IBJJF World Championships. His two-year suspension is in effect until September 29, 2018. Tournament organizers DQ'd Miyao following the win when they were informed Miyao's suspension was still active. United World Wrestling is a WADA signatory, meaning they recognize and enforce any suspensions issued by related organizations. 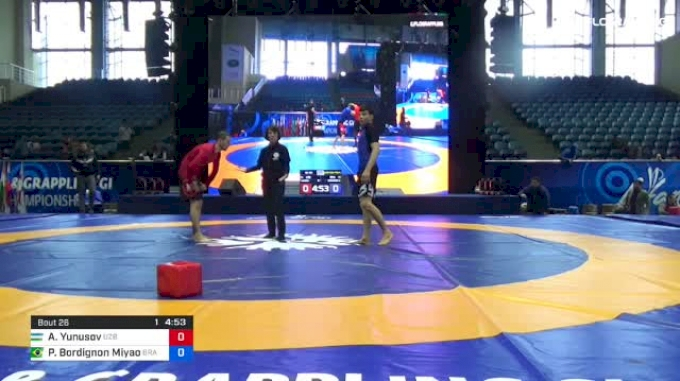 Miyao has competed in other grappling events since the suspension came into effect such as ADCC and UAEJJF, but these events are not bound to follow USADA or WADA-issued bans. "This weekend I went to participate in the UWW World Championship, but unfortunately I could not fight due to the doping test two years ago at the IBJJF World Championship. I apologize to UWW for believing that my punishment was only valid for IBJJF championships." With additional reporting by Michael Sears.